The Par for the Office polo is pictured above in navy blue and the Wall Street Golf Polo is pictured below in bright red. Right away I noticed the quality of these Italian-made shirts, both using 100% cotton, along with the distinctive designs. 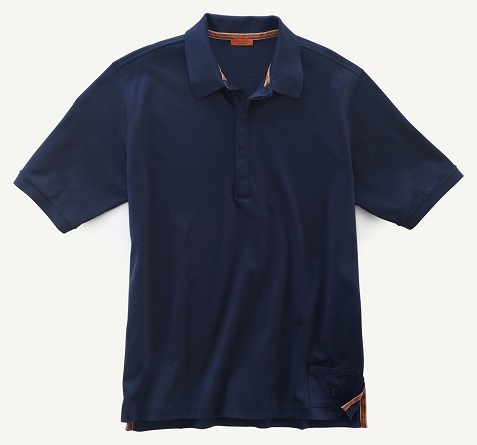 The Par for the Office is their signature short sleeve luxury men’s polo using double mercerized cotton. The fabric is very soft and smooth giving it a clean a crisp look, and it would work nicely in a number of settings both day and night, including with a blazer. The Wall Street Golf Polo is a notched short sleeve button down polo in an exclusive Italian cotton pique, so the woven style gives it a more textured feel. The look and feel of this polo is more casual and probably works best for a round of golf and daytime settings. Both polos feature the company’s signature snap “lifestyle” pocket with self embroidered logo located at the bottom left of the shirt in the front. If you tuck in the shirt this pocket will remain hidden, and it’s very convenient for holding keys, cash or a credit card. Both shirts also feature a vented hem and are machine washable.